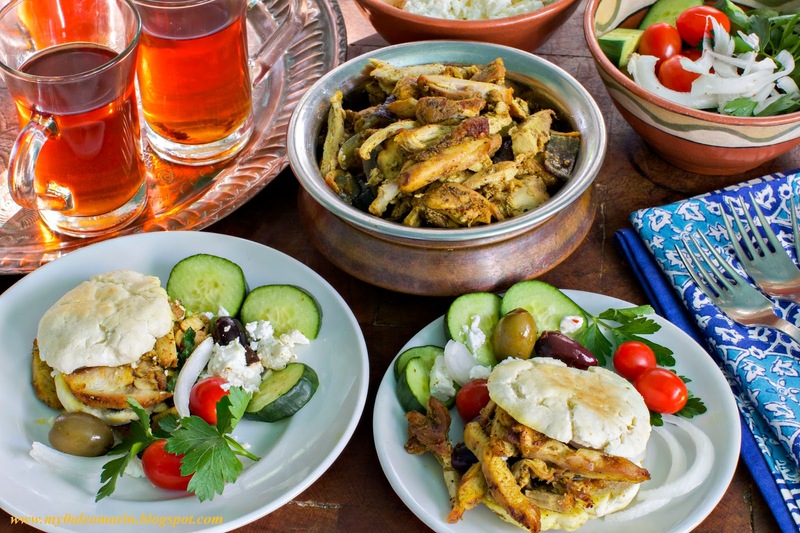 Shawarma is a traditional middle-eastern street food in which marinated meat is roasted all day on a vertical spit, then shaved off and served in a wrap with feta, tomatoes, onions and cucumbers. Reed didn’t exaggerate. Follow his easy recipe, and soon your home will resemble a bustling marketplace in Marrakech as your guests serve themselves, and you just "sit back and enjoy the compliments." For stuffing pita breads: chopped tomatoes, sliced white onion, cubed cucumber, crumbled feta cheese, and olives. 1. Combine the paprika, cumin powder, pepper, turmeric, cinnamon, salt, pepper flakes, garlic, lemon juice and olive in a bowl or container. 2. Add the chicken pieces and toss to cover well. Cover and store in the refrigerator for one or two days. 3. When ready to cook the meat, heat the oven to 425 degrees F. Add the red onion to the chicken and mix once. Put the mixture in a baking pan and roast for 40 minutes, or until the meat is cooked through. 4. Remove the chicken from the pan. Slice it thinly, and place under the broiler for about 4-5 minutes to add some crunch and extra flavor. 5. Place all ingredients on a platter or individual bowls. Garnish the chicken with parsley. 1. For a gluten-free pita bread option, see the recipe here (shown in photo); substitute grape seed oil for the vegetable oil. *2. Make the dough while the chicken roasts. Bake the pita pockets in the oven after the chicken is roasted and while you slice the chicken. When the pita breads are baked, put the chicken pieces under the broiler to finish cooking. Serve immediately. 3. Alternative wraps include red lettuce leaves, or store-bought pita bread (non-Paleo) briefly heated in the oven after the chicken is completed. 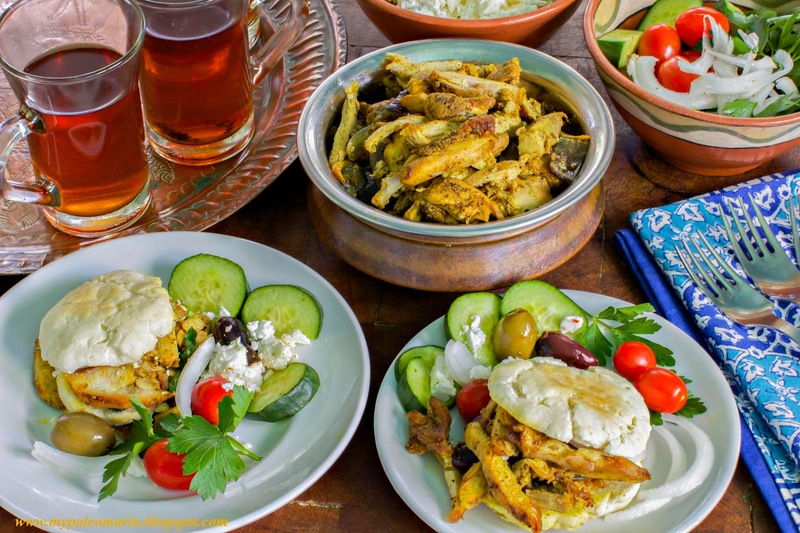 Thanks to Reed Freyermuth for the Roasted Chicken Shawarma recipe. Thanks to Gluten-Free on a Shoestring for the pita bread recipe.